Using their ingenuity and creativity during these tough fiscal times, educators across California are finding new ways to improve educational outcomes for all students. School district leaders are embracing a strategy that blends a focus on instruction with a partnership approach that engages the entire community in creating the opportunities and support that students need to be ready for college, career, and citizenship. Leaders in many different institutions – school districts, cities and counties, United Ways, higher education, community and faith-based organizations, and business and civic groups – are working together to make this happen. They have a vision of schools as centers of community, what many now call community schools. Oakland, San Francisco, Lake County, and Redwood City, among others, have district-wide strategies to grow community schools. Parts of Los Angeles and Fresno, as well as smaller districts, are moving in this direction. The California School Boards Association has issued a policy brief about community schools. At the heart of community schools work is a willingness on the part of local stakeholders to rethink how they can use existing resources more effectively and efficiently. Whether the dollars come from federal, state, or local sources; are intended to serve children, youth, or families; or are focused on health or mental health, after-school enrichment, mentoring, family engagement, or any other particular service, they are all being aligned through partnership to achieve a set of results of concern to all: more readiness for school, higher achievement, better attendance, enhanced social and emotional development, reduced violence, and deeper civic engagement. Using this local partnership strategy, California has recently captured competitive federal grant funds. California won a $52 million Race to the Top Early Learning Challenge grant and will direct the majority of these funds to regional consortia that bring together all the local entities in a given area that provide early education and care to young children. California communities have also won federal funding from the Obama administration’s high-profile Promise Neighborhood Grant competition. The Promise Neighborhood program recognizes the interconnected nature of the academic, social, emotional, physical, and civic development of young people in the communities in which they live, and utilizes community-based organizations or higher education institutions to engage schools and numerous other community partners. Finally, California-based organizations received five of 21 federal Full Service Community School grants, which they are using to grow the community school strategy. The community school strategy can be a key element of California’s education reforms. In his Blueprint for Great Schools, Superintendent of Public Instruction Tom Torlakson calls for addressing both academic and non-academic factors to enhance students’ academic achievement and personal development and to encourage the development of community school approaches. Gov. Jerry Brown is proposing far greater flexibility and decision-making at the local level, an approach that will facilitate locally driven efforts like community schools. California school reform efforts focused on school-community connections reflect a larger community school reform strategy growing around the country. This development demonstrates a recognition by school and community leaders that every individual and organization in every community has a role to play in the education of our children. Martin J. Blank is the president of the Institute for Educational Leadership in Washington, D.C. He leads the Institute’s efforts to build the capacity of people, organizations, and communities to work together to attain better results for children and youth. He also serves as the director of the Coalition for Community Schools, which is staffed by the Institute. The Coalition brings together leaders and organizations in education, human services, youth development, early childhood, community development, government, and philanthropy to advocate for community schools. To learn more about community schools, attend the Coalition for Community Schools National Forum in San Francisco, May 9-12, 2012. In six years, when Gov. Brown’s proposed new funding system is fully phased in, the average statewide funding per student is expected to be $9,200. At that time, the per-pupil funding for Los Angeles Unified would be $1,250 higher per student – $10,460; Coachella Valley Unified, a 17,000-student district in Riverside County, would receive $12,162 per student. At the opposite end, Pleasanton Unified, in Contra Costa County, would receive about $5,000 less per child than Coachella Valley – $7,198, or a little more than 1 percent above the $7,073 it’s scheduled to receive in Prop 98 funding next year. Berkeley Unified would get $8,212, only $515 more per child after six years of phasing in the new finance system. 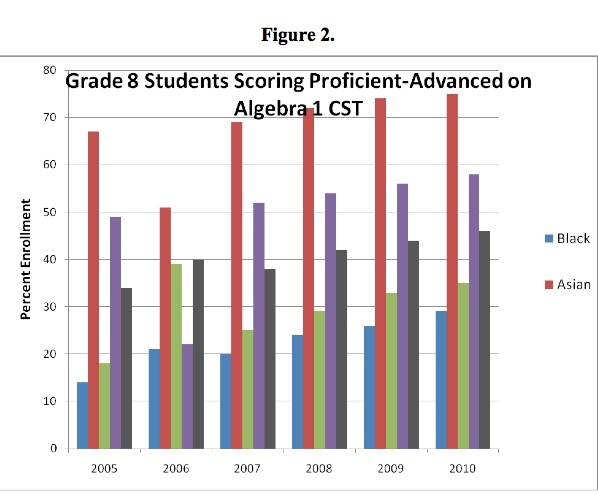 In its broadest terms, the weighted student formula system gives extra dollars to districts with large numbers of English-learning students and those from families with low incomes – out of recognition that these children require extra resources to compensate for their disadvantages, and perhaps to attract and retain good teachers. 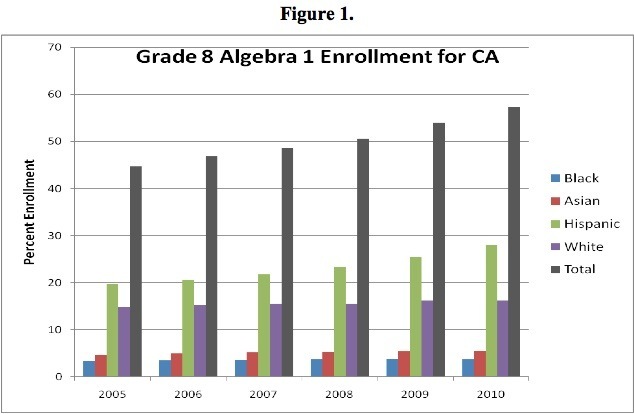 Those districts with very low percentages of these children not only would get relatively less, but, like Pleasanton, would not benefit, after years of facing substantial cuts in state funding, from what Finance officials are predicting will be substantial increases in Proposition 98 funding levels in the next half-dozen years. Under the current system, districts get roughly the same basic per-student allotment (generally but not always within a 10 percent range), plus extra money from categorical programs for designated purposes – many of which do serve poor kids. Brown wants to throw most of the categorical money into a pot and redistribute it to the targeted children. Since some of the formulas for categoricals like Economic Impact Aid, home-to-school transportation, and Targeted Instructional Improvement Grants (desegregation funding favoring a handful of urban districts) are dated, one can argue that the new system would be fairer and simpler. However, because Brown is not guaranteeing minimal increases in base-level funding, some districts – particularly high school districts and rural districts with a lot of bus money – that benefited under the current system would lose out under a weighted system unless the formula is changed. Brown builds in the assumption that his proposed temporary $6.8 billion tax initiative will pass in November. If it doesn’t, all bets are off. The Department of Finance assumes that Proposition 98 funding will increase a healthy 40 percent between now and 2017-18 as the state’s economy recovers. That’s why Brown can claim that, with very few exceptions, districts will do better in 2017-18 than in 2012-13. The weighted student system consists of a uniform base grant, comprising 68 percent of the Proposition 98 funding for the system, and the supplemental funding for disadvantaged students, making up the remaining 32 percent. The base grant will start out at $4,920 and grow to $6,660 in 2017-18. The weighted student formula does not include about $3 billion in categorical funds that would continue to be protected. The largest is special education funding, along with after-school and school nutrition programs. This is the first pass; Brown administration officials have indicated a willingness to change it, and, as you will see, there are reasons to do so. Basic aid districts – the roughly 10 percent of districts that are funded with property taxes alone – are not included, though they would be affected through a loss of categorical money. Using Alameda County, above, to illustrate, the most important columns in the chart are 5, 11, and 14. Column 11: The per-student funding in 2017-18, after the full implementation of the weighted student formula ($7,981 for Alameda City Unified). Column 14 (far right): The dollar difference between the 2012-13 and 2017-18 funding ($1,679 for Alameda City Unified). Columns 6-13: Brown is proposing to phase in the formula over six years; the columns show the effect on per-student funding and net difference over that time. In 2012-13, only 5 percent of per-student funding will include the weighted formula; the rest will be the current system. Brown is proposing to hold all districts harmless, with no loss of money next year only (column 6). So in 2013-14, without that protection, some districts, including Berkeley and Pleasanton, will lose some funding per student with the formula based 15 percent on the formula, 85 percent based on the old system. Some small rural districts with big busing expenses will lose the most under the new system unless busing as a categorical is protected, as some rural superintendents are proposing. Columns 3 and 4: The percentages of students who are English learners and are from low-income households. Extra dollars are based on these figures. (Since about three-quarters of English learners are also low-income students, there is overlap. The formula, however, does not double count. To estimate the correct number of non-low-income English learners, the Department of Finance multiplied the EL percentage by one-quarter and then added this percentage to the low-income percentage. In the case of Alameda City Unified, a quarter of 22.37 percent is about 6 percent EL, added to 32.5 percent low-income for a total population of disadvantaged of 38.5 percent. The funding of East Side Union High School District in San Jose, the state’s second largest high school district, illustrates the need for two potential changes to the formula. One would be to continue the current funding system’s awarding of extra dollars to high school districts and, to a lesser degree, to unified districts, out of recognition that older students incur higher expenses. East Side Union would get $7,257 per student next year under the current system, nearly $1,000 above the state average. In 2017-18, it would get $8,155, more than $1,000 below the state average. For a district struggling to prepare students for college and the job market, that will be tough. East Side Union may also be hurt by the use of free and reduced lunch eligibility as the criterion for the low-income weight. Signing up for lunches is voluntary, and fewer students do so in high school than in elementary school. East Side Union’s feeder districts are roughly 60 percent low-income. East Side Union is 40 percent. The drop will translate into a lot fewer dollars under the weighted formula. Using a district’s Title I numbers, which are based on census data, may be a more accurate measure. The formula gives bonus money to districts with high concentrations of disadvantaged students, starting when they comprise 60 percent of a student body. A district with 80 percent disadvantaged students w0uld get nearly $3,000 per student more than a district with 50 percent. The Legislature may want to examine the research justifying such a difference. Thanks to Bob Blattner of Blattner and Associates of Sacramento and Nick Schweizer of the Department of Finance for walking me through the numbers. Blame me, not them, if there are any mistakes in translation. California is apparently passing up the opportunity to request a waiver from the No Child Left Behind law, setting up another round of schools and districts to be labeled as failing. Interestingly, state leaders say they are opting to keep in place a set of requirements that no one seems to support as a protest against the imposition of a new set of requirements, even though states are being invited to help craft the new requirements. Let’s be clear: The central issue with regard to the NCLB waiver is not cost, it is accountability. The primary cost of a waiver is the cost of implementation of the Common Core standards. The primary cost of Common Core is associated with new instructional materials and associated training and support for teachers. But we are facing these costs, waiver or no waiver, since our current books are wearing out. There are also costs – though much smaller ones – associated with a longitudinal data system. But despite disagreements about the design and management of such a system, California certainly has a data system in its future. The real issue with regard to the waiver is accountability. For more than a decade, public education has been focused on accountability. 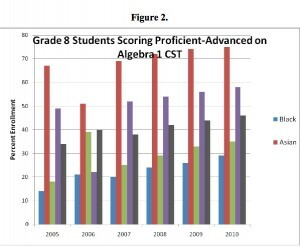 The architects of this approach held that by increasing levels of accountability, outcomes for students would improve. Today, after more than a decade of work, outcomes have improved somewhat; but despite a lot of work, the system has not been transformed. Meanwhile, unintended consequences have included a narrowing of the curriculum, the elimination of enrichment opportunities, and gaming of the system or even cheating. Opinions differ on what to do now. Some argue that the testing-and-accountability strategy has not been disproven; we just need better standards, new tests, and a different set of targets. Others argue that the real problem is that NCLB got the unit of change wrong and that we need to hold teachers, not schools or districts, accountable. The Obama administration has opted for a “both/and” strategy. But what does California want to be accountable for? Is our answer really “nothing” or “as little as possible”? Surely we can do better than that. Surely we can agree that accountability is part – but only a part – of this nation’s approach to school improvement. Of course, schools should be accountable. But to whom and for what? What can we learn by looking at other fields? Decades of experience in arenas like health care tell us that accountability data is rarely or never useful to drive an improvement process, and that trying to create a blended data system that serves both purposes usually leads to a system that is not very useful for either one. This makes good sense in health care; hospitals need to keep track of who died and why, but to improve mortality rates they may need to start counting how many times doctors wash their hands. Yet nobody thinks hand washing belongs in the accountability system; hospitals need to keep two different kinds of data and use them for different purposes. Schools do, too. For example, “wait time” – the length of the pause between a teacher asking a question and her next sentence – might be worth measuring since it, like hand washing, is part of improvement. But no one thinks it should be part of an accountability system. Our problem is partly that limited resources means required data trumps optional data. But the other half of the problem is that we’re not trying; in education, when someone says “data,” listeners usually hear “test scores.” Period. If we try to rethink accountability in ways that leave room for data on improvement, we run up against another complicating factor: The fundamental accountability relationships in public education are between teacher and student, school and family, and district and community. Our current approach to accountability, which holds schools accountable to goals that communities haven’t created and largely don’t understand, has eroded, rather than strengthened, these fundamental accountability relationships, and that is a major cause of the woeful state of school funding and of the appetite among parents for charter schools – even for ones that are no better than the regular schools they left. If this is true, then state leaders have a dual challenge as we rethink accountability, a challenge that stretches far beyond the technical task of creating better tests and targets. We need an accountability system that creates the conditions for districts to collect improvement data – the education version of hand washing – and that repairs the broken bond between schools and communities. Could the current policy vacuum, in which NCLB is rapidly fading away without a replacement on the horizon, present an important opportunity to work on a system that meets these dual goals? Maybe. But only if we replace the “just say no” approach with some new thinking. Merrill Vargo is an experienced academic and a practical expert in the field of school reform. Before founding Pivot Learning Partners (then known as the Bay Area School Reform Collaborative) in 1995, Dr. Vargo spent nine years teaching English in a variety of settings and served as Director of Regional Programs and Special Projects for the California Department of Education, where she was responsible for major initiatives including School Restructuring, Charter Schools, Goals 2000, and the ground-breaking high school reform report Second to None. Pivot Learning Partners is an entrepreneurial nonprofit organization providing support to more than 60 school districts. Now, Therefore, I, John F. Kennedy, President of the United States of America, do hereby designate the period from November 5 through November 11, 1961, as American Education Week. I urge that all of us during that week take part, through school and community, in observances to focus attention upon the force for good which education has been and must continue to be in our national life; and that we honor our teachers and school officials for whom every week is education week. The education of our people should be a lifelong process by which we continue to feed new vigor into the lifestream of the Nation through intelligent, reasoned decisions. Let us not think of education only in terms of its costs, but rather in terms of the infinite potential of the human mind that can be realized through education. Let us think of education as the means of developing our greatest abilities, because in each of us there is a private hope and dream which, fulfilled, can be translated into benefit for everyone and greater strength for our nation. DONE at the City of Washington this twenty-fifth day of July in the year of our Lord nineteen hundred and sixty-one, and of the Independence of the United States of America the one hundred and eighty-sixth. Days after signing a bill restoring $248 million in school bus funding for the rest of this year, Gov. Brown has done an about-face and also agreed not to eliminate school bus funding in next year’s budget. Instead of cutting other parts of the K-12 budget to make room for $500 million in home-to-school transportation, Brown has chosen to commit some of the new taxes that he’s asking voters to approve in November for that purpose. Brown had intended to use $2.5 billion in new revenue from temporarily raising the sales and income taxes to eliminate some of the state’s late payments to districts, IOUs known as deferrals. Instead, only $2 billion in deferrals will be paid off next year. After next year, Brown wants to treat school transportation like any other categorical program; under the governor’s new move to flexibility, all of the categoricals will be lumped together, giving districts the option to spend the money as they choose. Over the next six years, however, Brown is proposing to convert to a weighted student funding system; categorical money will be thrown in one big pot and redistributed to districts based on the number of low-income students and English learners they enroll. Districts with big bus and other categorical funds but few disadvantaged students will find that they will lose some money they’ve been getting. In restoring bus money, Brown recognized the liability of asking voters to raise taxes for education while at the same time eliminating money for a vital service for many rural and some urban districts, like Los Angeles Unified. Now, Brown can say that at least districts won’t be losing funding next year. The half-year, $248 million for transportation that SB 81 restores is a different story. As part of the current state budget they passed last year, Brown and legislators said they’d cut bus money if state revenue came up short by December. It did, so the half-year bus transportation cut was to be automatic. After strongly affected districts protested, the Legislature decided to make up for $248 million by deducting $42 per student from every district’s base funding instead. That cut equals 0.65 percent of districts’ revenue limit. Parents from around the state have reviewed the governor’s proposed 2012-13 budget, and we would like to say, loud and clear, we are disappointed. We were hopeful that the Legislature and Gov. Brown would put together a budget that would ensure that schools, at the very minimum, would have stable funding for next year. We are still hopeful. But the proposed budget doesn’t even come close. The main issues are 1) depending on an initiative passing after the school year has begun, and 2) moving the debt service into the school fund. There is a silver lining, however, in the form of the newly proposed weighted student formula. Such a system would be a huge improvement over the existing convoluted scheme, although there are many specifics as yet unresolved. Nevertheless, regardless of how the money is distributed, there simply isn’t enough, and our children in California lose. Many districts are being advised by School Services of California (consultants who make financial recommendations to school districts) that they should plan on a $370 decrease per student in the event the measure does not pass. By law, staffing decisions and teacher layoff notices need to be made by March 15. School district budgets are required to be balanced and approved by June 30. Our school districts are in a quandary. Do they base their budgets and staffing decisions on the worst-case scenario, or do they base them on a hopeful outcome that depends on the governor’s initiative passing, which could lead them into an even more precarious financial situation such as insolvency? The proposed budget, which includes revenues from the ballot measure even though it may not pass, essentially maintains funding at its current level. If the ballot measure fails, there is likely to be an additional $4.8 billion (the equivalent of three weeks of school) cut from education. In order to offset this potential cut, schools are forced to plan to issue layoff notices (thus increasing class sizes), to cut programs (including libraries, art, and music, if they still have those programs), and to eliminate or reduce transportation, vice principals, counselors, and other staff. Should they simply hope for the best and risk putting their district in further financial jeopardy if the initiative does not pass? Now let’s imagine our districts make the financially responsible decision and budget on real numbers – unlike Sacramento’s – eliminating thousands of teachers and programs. Come November – hooray! – the initiative passes! How will those school districts hire back all the teachers who have been laid off? Can they add days to a school year that has already been set, keeping in mind that each of the 1,000-plus districts will have to negotiate with their local unions in order to do so? How will parents adjust their schedules to deal with this uncertainty? Either way, one thing is for certain: This situation is a lose-lose for kids. In the current budget proposal, $2.6 billion in general obligation bond debt-service payments would be shifted to Proposition 98 in the event that the governor’s revenue measure fails. Let me explain in lay terms what this means. More than 20 years ago, in an effort to save education funding, the voters passed “Proposition 98,” a constitutional mandate for a minimum level of funding for our schools, roughly 40 percent of the General Fund. Because of dwindling resources and other priorities, the last four governors have amassed debt and have tried to work around Prop 98 to keep expenses down. It’s as if the state racked up a lot of charges on its credit card but can’t pay them off. Previously, the general obligation bond debt payments have been paid from the general fund, not the portion that is set aside by Prop 98 for education. However, if the governor’s initiative fails in November, he wants to make the payments for K-14 debt-service out of the Prop 98 funds. This reduces the amount of funds in Prop 98 that can be sent to districts to operate their schools. Not only is this debt-service payment proposal unprecedented, it was not part of the agreement when the bond was issued. Even the Legislative Analyst’s Office has serious policy concerns with this, and notes that “the proposal would result in notably greater volatility for education programs.” It is unacceptable to burden our children with this debt, and the last thing we need is more volatility in education funding. Previous generations knew the key to our state’s future was properly educating our future leaders. California was once known for its high-quality public education. However, recent leaders in California have used gimmicks to fund our schools and have allowed education funding per pupil to drop from 27th to 47th in the time since the passage of Proposition 98. Even if the governor’s proposed tax increase passes, we are still funding far less than what the voters demanded when they passed Proposition 98 more than two decades ago. The governor and the Legislature need to support education instead of finding loopholes. They need to be honest with the voters and walk the talk. The proposed budget does not allow our school districts to properly educate our youth and is unacceptable. Just so we do not leave you completely depressed, let us revisit that silver lining. The governor has proposed a major overhaul of the way money is distributed to schools. He has recommended a system known as a “weighted student formula.” (Click here for more information.) Rather than the current, convoluted system of more than dozens of education funding streams with restricted purposes, a weighted student formula gives districts money for each student based on his or her needs, and the money follows the student. So, if a student changes districts, the money moves with that student. Implemented properly, this will lead to less red tape and more equity. We thank the governor for recommending this long-overdue change. Empowering local school districts to determine their varying needs is an important step in the right direction. Since there isn’t much information released about his plan, it is hard to stand fully behind it, as it seems to have overlooked high school districts, but we remain pleased with the way it’s headed. So what do parents want to see in the budget? It’s simple. Enough money and resources for all kids in California to have access to a high-quality education. There is no way to provide an excellent learning environment for kids if each year we are forced to lay off teachers, cut programs and staff, and budget on uncertainty. We are asking the governor, the Legislature, and our fellow citizens to think long and hard about what message this sends to the children of California and what the long-term consequences are of failing to adequately educate this generation. If children and the future of our state are not our number one priority, what is? What is our request of the governor and the Legislature? Work together to build a budget that reflects our values as parents and as California citizens. We promise to have milk and cookies waiting for you when you get home. Crystal Brown is the Board President and a co-founder of Educate Our State, a parent-led, statewide campaign to unite the voices of Californians in support of high-quality K-12 public education and demand real change. She is the parent of three children attending public school in San Francisco. Amid the current flurry of state policy reform activity around teaching, I’ve been thinking about what’s missing. My conclusion: A focus on teachers as learners. Too many state policy efforts to strengthen educator effectiveness focus narrowly on identifying and removing poorly performing teachers. Where that gets us is largely dependent on who replaces them. But teachers feel under attack as a result of particular reform rhetoric and the “gotcha” focus of such policy changes. Some advocates point to this too-narrow approach to measuring and sorting teachers as a silver-bullet solution to improving educator effectiveness. A recent high-profile study about the long-term impact of teachers finds that having an effective teacher matters – during school years and beyond. When offering conclusions and recommendations in this page one article from the New York Times, however, one of the authors promoted a singular method of identifying and removing poorly performing teachers (“fire people sooner rather than later”) – rather than suggesting a more comprehensive or nuanced solution. Even the critical work of building educator evaluation systems sometimes appears to prioritize grading and ranking teachers over improving teaching performance. Let’s be clear. Designing and implementing evaluation must include two distinct components: (1) measuring teacher performance and (2) implementing systems to develop and, as needed, improve teacher performance. Policymakers should make teacher development a more central focus of their current efforts. Teaching policy cannot become a set of solely accountability-focused or punitive measures. This is a point underscored in a recent Center for American Progress paper (Movin’ It and Improvin’ It!). Indeed, a comprehensive performance management system for teachers should not only measure performance, but also provide systemic opportunities for teachers to develop their practice and continuously learn and improve. Providing support and feedback to teachers only after they’ve failed an evaluation is shortsighted. But this is exactly how many state teacher evaluation systems are being designed. 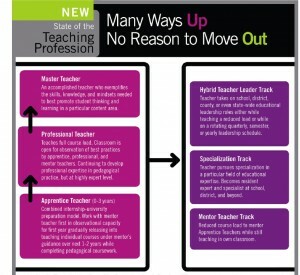 New teachers, in particular, need special attention, both in schools and within state policy. Beginning educators have distinct needs and an initial learning curve. Research shows that comprehensive, high-quality teacher induction accelerates new teacher effectiveness, improves student learning, and reduces teacher attrition. That’s why, at New Teacher Center, we believe that every state should require all first- and second-year educators to receive the support they need to thrive in the classroom and improve student achievement. This is an unfortunate national trend. While states demand more accountability from educators, some are simultaneously reducing or zeroing out dedicated appropriations for teacher induction and suspending programs entirely. Most never provided such funding to begin with. As NTC’s Review of State Policies on Teacher Induction shows, most state policies lack a strong commitment to high-quality teacher induction and mentoring. Few envision teacher induction as a vehicle for instructional improvement, few have established quality induction program standards, few identify and train effective mentors, and almost none give local programs the needed resources to provide comprehensive support for new teachers. For state teaching reforms to actually strengthen classroom effectiveness, they will need to attend to teachers as learners. To accomplish this, policy must chart a balanced and comprehensive course toward teaching excellence. Especially given that today the typical classroom teacher is a first-year teacher, state policy must include the provision of high-quality induction, on-the job professional development, and supportive teaching conditions to enable all educators to maximize their effectiveness. If we don’t help all teachers to succeed, we will diminish their potential impact on student learning and likely make the teaching profession a less attractive option for the current and future generations. Liam Goldrick is Director of Policy at New Teacher Center, a national nonprofit organization dedicated to improving student learning by accelerating the effectiveness of teachers and school leaders. Mr. Goldrick leads a range of initiatives designed to strengthen new educator induction and mentoring policies at the state and national levels. Most recently, he served as project lead on the NTC Review of State Policies on Teacher Induction, which includes a policy paper and individual policy summaries for all 50 states. How representative is this not-so-silent minority? Gov. Jerry Brown no doubt has been wondering, too, and increasingly calling on lawmakers to pass his 12-point pension reform plan. “Please take up the issue and do something real,” he told the Legislature in his annual State of the State address. And Brown has come back to the issue repeatedly during speeches and media appearances around the state. Simitian, a Palo Alto Democrat who’s one of six legislators on a conference committee charged with coming up with a solution, didn’t offer much assurance. “It’s not clear to me what the Legislature or the conference committee is prepared to do,” he said. But reports last week from the California Public Employees Retirement System (CalPERS), the nation’s largest public pension plan, and the California State Teachers Retirement System (CalSTRS), number two behind CalPERS, should serve as a sober warning to legislators not to run from the issue. CalPERS reported a meager 1.1 percent return on investments in 2011, while CalSTRS reported a tad better at 2.3 percent – far below the 7.75 percent rate of return that both pension funds need to meet payouts to retirees. Though CalSTRS had a spectacular fiscal year that ended June 30, its investment portfolio then fell $7.9 billion in the six months ending Dec. 31, to $144.8 billion. CalSTRS’ 10-year return was 5.4 percent, and, as writer Ed Mendel noted in his latest post in Calpensions, many financial analysts are predicting another decade of low returns. A failure to make the rate of return will add to both pension systems’ unfunded liability, which is the taxpayers’ burden. For CalSTRS, currently only 71 percent funded, the unfunded liability is $56 billion. 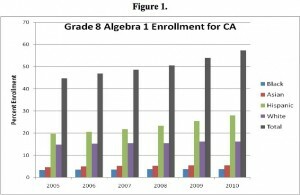 Lowering the expected rate of return in line with what experts are predicting would immediately result in higher contributions from the state and school districts, in the case of CalSTRS. Either way, districts and the state face laying out billions more per year in coming decades to keep CalSTRS solvent – money that will be diverted from the classroom. On Thursday, the CalSTRS board will consider a staff recommendation to drop the investment forecast 1/4 percent, to 7.5 percent; the impact would raise contributions by the state and districts by $500 million per year. Brown’s plan would significantly decrease benefits for new public employees, and lower the risk for governments, by raising the retirement age from as early as 55 to 67 for all new public employees except safety workers. It would cap the amount of salary qualifying for a defined benefit, affecting mostly higher paid administrators in the case of CalSTRS, and it would end spiking, the practice of raising salaries and benefits in the last few years to jack up an employee’s pension. In the biggest change, it would replace a significant portion of a defined benefit plan for new employees with a defined contribution plan similar to a 401(k). At the last hearing of the conference committee this month, CalSTRS’ deputy chief executive officer, Ed Derman, offered a variation of the defined contribution plan that would offer security to employees, while reducing costs and risk for employers. Under a “cash balance plan,” workers would contribute a portion of their earnings, matched by the employer. CalSTRS, not the individual, would manage the investment, and would guarantee only the rate of return equal to a long-term Treasury note, plus the principal. If the rate of return by the time of retirement turns out to be greater, the employee wins. CalSTRS already offers this option as a retirement supplement to members. A cash balance plan may be more palatable to employees than a straight 401(k), but unions are expected to resist the higher retirement age and switch to a defined benefit program. And this is an election year, when Brown is counting on union support to underwrite the campaign for his tax increase. So far, the conference committee has gotten little done, and three months after introducing his 12-point plan, Brown has yet to flesh out details. That’s expected to come this month. Compounding the challenge, two-thirds of the Legislature must approve putting an initiative before voters, because it will amend the state Constitution. And, as Simitian noted in the video clip, five out of six members of the conference committee must agree on a package to present to the Legislature. That’s a tall order for any proposal, and this one will require bipartisan support. Will voters withhold their support for a tax increase for failure of action on pension reform? Legislators may not want to put that question to a test.